Addicted to Minecraft? Want to play anywhere and take your worlds with you? 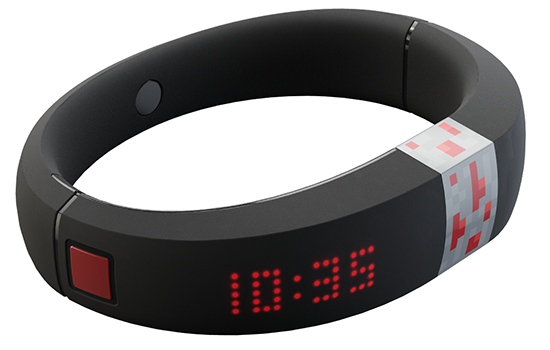 What you need is a Gameband and we have ten up for grabs! Designed to be the first-ever Minecraft wearable, Gameband Minecraft lets you play anywhere, anytime, on any computer and saves your worlds onto a secure cloud-based server. The device comes pre-loaded with stunning maps from Sethbling, Hypixel and Dragnoz, and also ships with PixelFurnace, an app that lets you customise Gameband with messages, images and animations. Ready to take your Minecraft experience to another level? Answer the following simple question to enter our free prize draw, and don't forget, you can also claim a second entry via Facebook to increase your chances! Need a clue? You'll find the correct answer at gameband.com. The prize draw is open to HEXUS readers in the US, Canada, Europe and the UK aged 12 years or over. The competition winner will be picked at random from all eligible entries that arrive the closing date, August 29, 2015 GMT. The winners will be notified via email by September 5, 2015. The winner must claim their prize within 7 days of the promoter sending notification. If the prize is unclaimed after this time, HEXUS reserves the right to offer the unclaimed prize to a substitute winner selected in accordance with these rules. The prize is one of 10 Gameband Redstone wearables. Entered ! No choice as my youngest spotted it !! But i win one i would have to buy another as both my boys are into minecraft this minecraft that ,bla blah mine bloddy craft !!!! Not entering this one - Minecraft is not my thing. Just wanted to thank Hexus for another give-away of a neat item, and wish all those who enter the best of luck. Entered this one for the sake of giving Halo as the answer, I guess it probably counts as some sort of viewership and resposne rate stats for Hexus too. No interest in this competition personally however like GuidoLS, but thanks none the less. Entered for the kids as they love Minecraft.